When opening opened existing graphics in Photoshop, web designers would have noticed drastic color shifts. 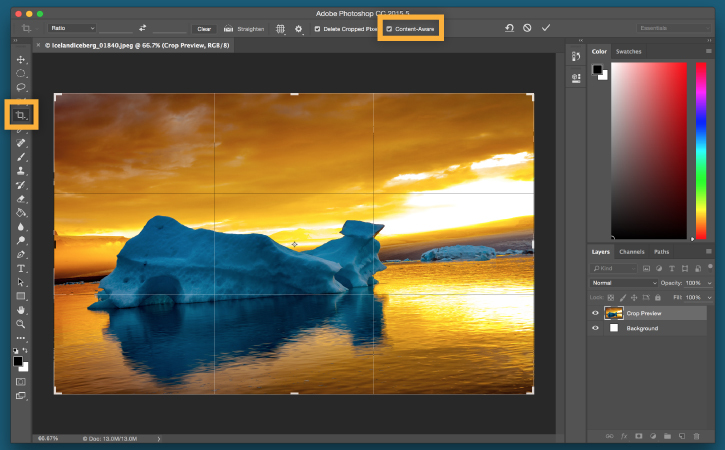 The new color management system used in Photoshop reinterprets files by default. If you work with Web graphics, you need to turn this feature off. Open File > Color Settings > Profile Setup. Uncheck RGB under the embed profiles. Under assumed profiles, select non form the RGB dropdown. Under profile Mismatch Handling, select Ignore. If you need to position an image in the center of the canvas, you don't need to calculate image parameters and reorganize the image accordingly. All you have to do is to cut the object and paste it back. If you get a warning on the screen like 'You scratch disk is full', you can free up some space by saving the file. However, Photoshop may not let you save it. Create small file, say 3x3 pixels and save it in Photoshop format. Photoshop will flush the scratch and you will be able to save the file that you are working. If you have on image that you use over and over again, such as a logo or signature, you can make it into a brush, when you create custom brushes from image files, Photoshop saves the image on your Brushes palette. Select the image, click on the Menu arrow on the Brushes palette and select Define Brush. The image now appears on the Brushes palette. You can use it just like any other brush. The new 3D Transform plug-in lets you work with 2D images as if they were solid 3D objects, so you can adjust the perspective on an image from straight-on to various angles. click on Filter > Render > 3D Transform. Draw a wire-frame on your image.. Use the Pan Camera and Trackball tools to manipulate the image perspective and click OK.
Make it an Action item. Actions automate routine tasks and save a lot of time, To create and Action, click on the Menu arrow on the Action palette and click on New Action. Click Record to start recording and carry out all the steps for the action. When you finish, click on the Stop button on the Action palette. To repeat the Action, select it and click on the Play button on the palette. The Fit image command resizes on image to fit within a given area without altering its aspect ratio. Click on File > Automate > Fit Image. Enter a new width or height and click Ok to resize the image.